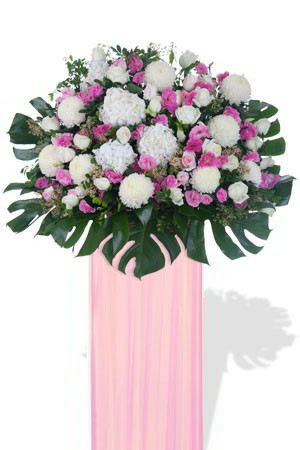 Show them they are in your prayers and send them this dramatic pink and white arrangement prepared with premium long stemmed Roses and Disbud Chrysanthemums. Please Note: Sympathy stands are traditionally sent to funerals and funeral homes, not to residential addresses. zFlowers.com recommends sending a sympathy bouquet to residential addresses as opposed to Sympathy Stands.